33 Shades of Green: On the Needles. . . I find myself wanting to knit quite a bit lately. I think it must be the cooler weather that has me wanting to knit up lots of warm, little things. It's hard to tell from this photo, but this little lovely is soon going to be a baby cardigan. 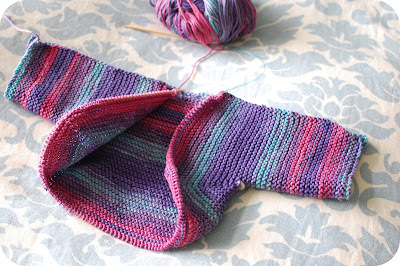 I'm working on the Baby Surprise Jacket (BSJ) by Elizabeth Zimmermann. The pattern was originally published by EZ in her newsletter in 1968. 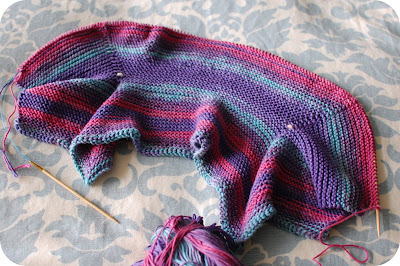 It's a really fun pattern to work on because the whole sweater is knit up in one piece. When you are finished all you have to do is seam up the sleeves, sew on a few buttons, and you have an adorable little cardigan! Here is a little better look of how the finished sweater will look. See - it's almost a sweater! To knit this up I am using a size US 4 circular needle and a beautiful 100% cotton yarn (made in Italy!). I have a friend at work who is pregnant and due in January. She isn't finding out what she is having (although she is certain it's a girl) and I am really hoping for a girl so I can give her this sweater! I do have a few ideas for baby boy gifts that I hope to get to this weekend. I would love to learn to knit! One of our club meetings will need to involve this!